Hanson UK, a leading supplier of heavy building materials to the construction industry, has been awarded a £350 million contract for Cwmbran hospital in south Wales. 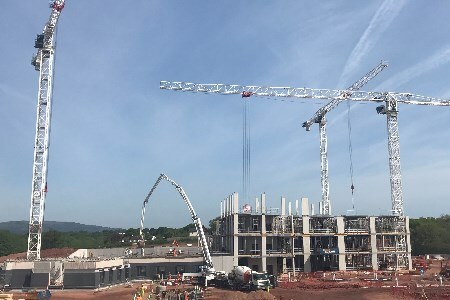 The 470-bed Grange University Hospital in Llanfrechfa, Cwmbran, will be built using 30,000m3 of concrete delivered from three Hanson plants, Newport, Cardiff and Ebbw Vale, over the next 18 months. The £2 million contract with Laing O'Rourke will see Hanson suppy 7500 t of cement, 60 000 t of aggregate, 7500 t of ground granulated blastfurnace slag, from its Penderyn, Ribblesdale and Port Talbot works. The £350 million hospital, which will provide specialist and critical care services and include a 24-hour emergency department and assessment unit as well as a helipad, is expected to open in spring 2021.